This article is cross-posted from The Diplomat. Read the original article here. In late 2010, an anonymous Chinese buyer snapped up a plundered 18th century Chinese imperial porcelain vase valued at $1.3 million for a stunning $86 million. A year later, a Chinese bidder purchased another vase from the Middle Kingdom for $18 million – more than 20,000 times the suggested price of $800. The demand for Chinese art and antiquities is booming. But despite the buying frenzy, China’s domestic market remains highly controlled, with the government restricting foreign firms’ access while aggressively encouraging Chinese firms to expand overseas. This market distortion doesn’t just artificially help Chinese auction houses – it could also fundamentally change the standards of the art market today. Today, China’s art and antiquities market rivals the United States as one of the largest in the world, with annual revenues of close to $12 billion – and growing. While sales in New York recently fell to half of their previous year’s level, they rose by 20 percent in China. This difference is even more striking given slowing growth in China and Beijing’s crackdown on sales of luxury goods. Fueling this growth is the rise in the number of billionaires in China, many of whom made their fortunes through export and trade. Active pursuit of repatriating allegedly looted Chinese antiquities has given the market a boost. The limited number of investment vehicles in China has also made buying fine art more attractive for its rapidly increasing values. Of course, the Chinese government has an interest in promoting a vibrant art and antiquities market. It has prioritized the development of a cultural industry as a means to create jobs, establish internationally competitive creators of content, and exercise “soft power” by promoting Chinese culture overseas. Chinese cultural companies are rapidly expanding at home and abroad. China’s homegrown auction market has developed rapidly, in part because of this support. Of the world’s top ten auction houses, six are now Chinese – and all but one is just a decade old. 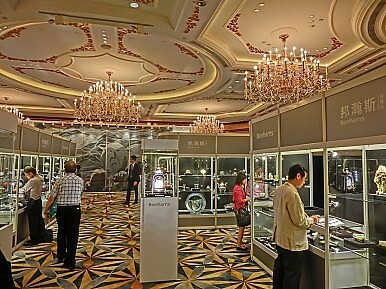 The state-owned Poly Auction House dominates the Chinese market, and is rivaling Christie’s and Sotheby’s in size. Interestingly, its parent company is the Chinese arm merchant, The Poly Group, which clearly has seen a financial benefit in launching an entertainment division that includes dealing in the fine arts. One of the most internationally known houses, China Guardian Auctions, is owned by the politically well-connected founder of Taikang Insurance, Chen Dongsheng. Chen – who is married to Chairman Mao’s granddaughter – has made no secret of his plans to elevate the domestic market. “I want to create China’s Sotheby’s, and I want to recreate China’s cultural aristocracy,” he told a Chinese newspaper. Sixth in the global rankings is the Beijing Council of International Auctions, owned by the Jiangsu Hongtu High Tech Company and led by flamboyant, rags-to-riches billionaire Liu Yiqian. Liu is well known in the international art markets for his record-breaking purchases, including a 15th century Tibetan silk Thangka for $45 million – the most ever paid for a Chinese artwork in an international action. He has a grand plan for his art collections: he has built two private museums in Shanghai focused on bringing Western art to China. Liu is on a global quest to bring home more treasures to fill his museums. Dominating the home markets is not enough. These Chinese firms have virtually unfettered access worldwide in the competition to sell – and procure – collectibles. They have been quick to establish in major art capitals to bring Chinese artifacts home but also to serve their clientele overseas. The Poly Auction House has set up office in an upscale Manhattan building across from the elite Harvard Club, with additional offices in San Francisco, Sydney, and Tokyo. Guardian is also growing overseas with locations in the United States, Japan, and Canada. Council lags behind with just an overseas office in New York, but plans to expand. Yet despite the growing demands of the new Chinese collectors, even the prestigious foreign auction houses are limited in their ability to serve the domestic market. While China seeks the return of its own heritage, it won’t permit foreign firms to sell these antiquities in China. Nor can they auction Western antiquities. Only one firm, Christie’s, has been approved to establish a wholly owned venture and conduct auctions in China. Sotheby’s joint venture with Beijing-based Gehua Cultural Development Group, a state-owned multimedia company in China, appears to be a troubled partnership. It’s no wonder as their businesses are so tightly restricted. While these two houses have been granted some degree of access to the Chinese market, they are still banned from selling “cultural relics” meaning any artwork created before 1949, the year of the founding of the People’s Republic. It is no coincidence that “cultural relics” are the most profitable sales in China today. To add insult to injury, sale of Western art and antiquities by the foreign houses is limited to post-1949 as well. If China truly wants to be a global player in the art world, it should not fear competition. Competing with the best improves the quality for all; opening doors to foreign auction houses will raise standards among Chinese firms – a necessity in a field constantly scandalized by fakes and looted antiquities. Opening up markets is never easy. But just as China has dramatically benefited from liberalizing its currency and financial markets in recent years, it would do well to show that same courage in opening its art and antiquities market.